How magical thinking and racism produced the NBA’s most notorious draft bust. 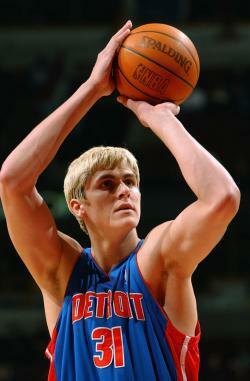 Darko Milicic, second pick of the famed 2003 NBA draft, was a professional bust. Ten years ago, a young man destined to transform the sport of basketball was drafted into the NBA. He hadn’t played a single minute in college and had appeared on the cover of a national magazine before turning 18. “He’s going to own the game,” one scout declared. Darko Milicic did not own the game. A decade after he was chosen with the No. 2 pick in the 2003 NBA Draft, he’s not even playing in the NBA. The only player drafted above him, LeBron James, is celebrating his fourth league MVP and second NBA title; the three taken after him—Carmelo Anthony, Chris Bosh, and Dwyane Wade—are likely bound for the Hall of Fame. Draft “busts” are a beloved sports talk topic, rich with the schadenfreude that comes when a bunch of people making a lot of money turn out to be terrible at their jobs. The common bust narrative decontextualizes its subject, with the bust seen as an isolated mistake as opposed to what it more often is—the product of widespread and deeply misbegotten consensus. The Detroit Pistons drafted Darko second overall because pretty much everyone would have drafted Darko second overall. In 2003, a scout told Sports Illustrated that one-fifth of NBA teams thought the young Serb would be better than LeBron himself. How did so many of the league’s talent evaluators convince themselves of something that now seems so absurd? As Pistons GM Joe Dumars himself admitted last year, the Pistons didn’t know all that much about Milicic when they drafted him. “With Darko, we may have had two sources of information. That was it,” Dumars said. Darko was the dubious beneficiary of a hazy mixture of groupthinking and magical thinking, a pre–YouTube moment made of wishful scouting reports from distant lands and flavored by a hint of racism. Milicic was the idealized vision of the Euro prodigy, a fantasy of the young and impossibly skilled white big man that proved so elusive in reality that it was practically cryptozoological. The story of Darko is the story of Nikoloz Tskitishvili, Maciej Lampe, Pavel Podkolzin, and Yaroslav Korolev, shipwrecks one and all, strewn upon the far shores of Basketball-Reference.com. Before Darko, there was Dirk. In 1998, Germany’s Nowitzki was selected with the ninth pick in the draft. Three years later, both Pau Gasol and Tony Parker were taken in the first round. The Euro prodigy craze of the Milicic era, though, had less to do with the success of their continental predecessors than with the rise of young Americans like Kevin Garnett and Kobe Bryant. In 1995, Garnett became the first player in 20 years to jump from high school to the NBA, setting off a 10-year prep-to-pro run that produced some of the best players of a generation: Bryant, Jermaine O’Neal, Tracy McGrady, Amar’e Stoudemire, Dwight Howard, and of course LeBron James. Ah yes, “the brothers.” In case the racial overtones of all this weren’t suitably naked, Darko offered a potent Great White Hope-fulness at a time when dominant white American big men had seemingly gone the way of Bill Walton’s right foot. The great imagined fear of the prep-to-pro era was that (black) American teenagers would use their talent to con generous NBA benefactors out of millions, only to turn their attention to dunk contests and rap albums as they destroyed the moral fabric of basketball. (The fact that the NBA finally banned American high schoolers the same year that it implemented its controversial dress code hardly seemed coincidental.) One of the many ironies of Darko bust is that so many saw him as a bulwark against what he actually became: a terrible investment in an unprepared kid. He just didn’t look the part. Any bust as spectacular as Milicic invites counterfactuals—“what-ifs” and “if-onlys.” Darko’s first coach, Larry Brown, was resolutely uninterested in the prized Serbian prodigy, playing him a total of 159 minutes in his rookie season. In a recent 2003 “re-draft” for ESPN, Chad Ford had Darko going 14th overall to the Sonics, where, Ford notes, “the chances of his earning minutes and developing right away would have gone up dramatically.” Earning many more minutes would have been difficult, though—had Darko played as often as LeBron James did that same season, he would have averaged more than eight fouls per game. A number like that is the mark of someone who does not know how to play basketball, and Brown had no interest in teaching him, not in a season in which the Pistons won the NBA championship, nor the next season when they were one quarter away from doing so again. The team that’s done the best job developing international players was the same one that denied Darko’s Pistons their second title, the San Antonio Spurs. The 2013 Spurs have nine players who grew up outside the United States; according to this recent ESPN the Magazine story, they win because they Play the Right Way and eschew AAU phenoms who don’t dribble or pass. The “recruiting analyst” concerned with “loafing, lousy fundamentals, [and] a pervasive disinterest from players in showcasing anything but themselves” may not be the same voice that once urged the drafting of Darko over “lazy and dunking” Americans. The tone sure matches, though, and it’s as ill-informed today as it was 10 years ago. Players like Manu Ginobili and Tiago Splitter—both of whom were drafted at age 22, and debuted in the NBA at 25—fit in with the Spurs for the same reason that Americans like Bruce Bowen and Danny Green fit in: They are experienced, thoroughly professional basketball players who know how to play in a system. That wasn’t the case with Darko, no matter his country of origin. Darko wasn’t the first kid to go bust in the NBA’s youth-obsessed era. In 1999, Jonathan Bender was taken fifth overall and was out of the league after 262 injury-riddled games. Nor was Darko the first Euro prodigy to be grossly overvalued. In 2002, the Denver Nuggets drafted 19-year-old Nikoloz Tskitishvili fifth overall, four spots ahead of 19-year-old Amar’e Stoudemire. And Darko didn’t even have a totally terrible pro career—he logged serviceable years in Orlando, Memphis, and Minnesota, and for a long while his name graced one of the finest basketball blogs of all time. He just had a terrible career for a player drafted ahead of Carmelo Anthony, Chris Bosh, and Dwyane Wade, and as such is destined to spend eternity as the answer to a boringly easy trivia question. In the 10 years since Darko came to America, international talent evaluation has become a calmer endeavor. In 2009, Spain’s Ricky Rubio was picked fifth overall and quickly emerged as one of the league’s most thrilling players; in 2011, the Czech Republic’s Jan Vesely was picked sixth overall and has thus far accrued more fouls than field goals. We’ve come to understand that sometimes these guys work out and sometimes they don’t, one of the many ways in which they are exactly like American players. Today, Darko would be drafted at an older age and likely stashed overseas for a few more years, at which point he’d join a team and might be a contributing player, even a star. But of course then he wouldn’t really be “Darko,” the international superhero everyone tried a little too hard to believe in.